Cartoon Made Martin Do It! Today’s Bergen Record reports that DEP Commissioner Bob Martin – just weeks after killing DEP’s proposed drinking water standard for the chemical perchlorate – will propose a standard “as quickly as possible”. We’d like to thank Senate Majority Leader Barbara Buono (D-Middlesex) for aggressively opposing Martin’s action to kill the DEP proposal and demanding that he act to protect NJ residents. Martin’s U-turn shows that legislative oversight can work (see Buono’s website post here). And Martin and Lt. Governor “Red Tape” “Regulatory Czar” Guadagno need to get their cover stories straight. First the pretext for killing the proposal was to wait for EPA to propose a standard “this summer”. Then it shifted to the need for cost benefit analysis. And then it was blamed on the allegedly “shoddy” DEP science and “no data” to show health risks. But, at the end of the day, it wasn’t the Bergen Record’s harsh press coverage, Senator Buono, the PEER criticism, the science, the EPA, or the non-existent cost -benefit analysis – we all really know that the cartoon made Martin do it! a person who eats the flesh of other human beings : [as adj. ] cannibal tribes. â€¢ an animal that feeds on flesh of its own species. The Star Ledger reports on another act of corporate cannibalism. Merck & Co. Merck is planning to close three facilities in New Jersey by the end of 2012, a report on Pharmalot.com said. The drugmaker will close Roseland and Lafayette facilities in 2010 and close the Union site in 2012, according to the report. The company also said it will layoff many people who work in R&D, such as in Lafayette, where Schering-Plough Research Institute has offices, and manufacturing, the report said. 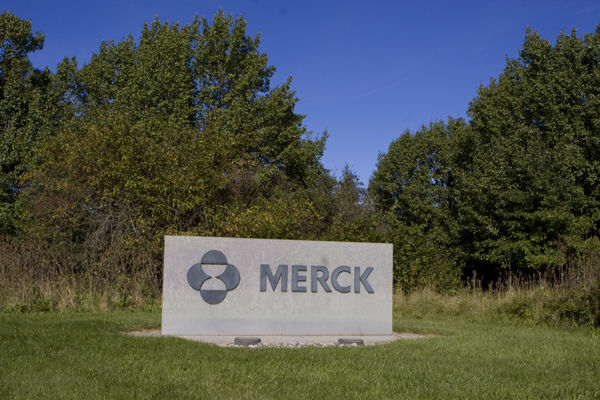 Merck didn’t buy Schering to become a larger company and take on all the Schering employees. Merck bought Schering to acquire all the named drugs Schering produced. The Schering employees knew this was coming. That’s why they’ve been having protests since the takeover. You idiots enjoy you teabags!! The Senate Budget and Appropriations Committee reviewed the Department of Environmental Protection budget today (you may listen to the hearing here and hit link for Commissioner Martin’s testimony). I will try both to summarize what went on and inject my analysis along the way. 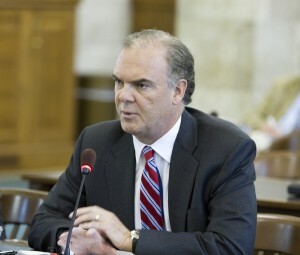 While legislators – on a bipartisan basis – again expressed praise for streamlining DEP and cutting red tape, for the first time democratic legislators raised objections to some of Christie’s environmental cuts and deregulatory policies. DEP Commissioner Martin opened the hearing with pretty much the same testimony he read to the Assembly Budget Committee (see this for Assembly hearing). Perhaps in response to criticism, Martin claimed that budget cuts that zeroed funds to the DEP Office of Climate Change ($373,000 cut), Policy & Planning ($1.1 million cut), Affirmative Action, and non-lethal black bear management ($575,000 cut) would have no impact. Remarkably, Martin claimed that the current work of those programs would continue uninterrupted despite these deep cuts. Martin did not explain how he could zero out funding for those programs and still have them perform at the same level. This is part of a pattern of denial and failure to assume responsibility for the negative impact of his policies. Senate Majority Leader Barbara Buono was first up and blasted DEP Commissioner Martin for killing a proposed drinking water standard for the chemical perchlorate. Buono noted that perchlorate is toxic and creates risks to pregnant women and young children. She stressed that even short term exposure increases risks to developing infants and children, and that the perchlorate standard had been under scientific study by DEP for many years. Noting that California and Massachusetts already have adopted strict standards to protect their residents, Buono demanded to know why Martin killed the DEP proposal. Martin’s reply was absolutely stunning and unprecedented in terms of its disingenuous attack on his own DEP scientists. Martin correctly explained that the perchlorate proposal was frozen by Governor Christie’s moratorium under Executive Order #1 and Red Tape Review process. But Martin did not explain how Governor Christie’s Executive Order #2 so called “common sense” policies (i.e. cost benefit analysis and federal consistency) were what killed the perchlorate proposal. Martin also failed to correct the record for the false statements he made regarding EPA’s efforts to develop drinking water standards “this summer”. Instead of assuming responsibility, Martin attacked DEP scientists by claiming that when he attempted to review the scientific basis for the proposed standard, he found that DEP science was “shoddy, poor, not organized, and anecdotal” and that “there was little data and science to back it up”. But we disclosed EPA emails that show that Martin’s rationale here is completely bogus. Martin ignored his own scientists – who are recognized national expert toxicologists – and waited until just days before the legal expiration date of the rule proposal to contact EPA scientists. Thus it was Martin’s mismanagement and Christie’s policy – not DEP science – that explain this failure to adopt the proposed standard. Martin’s attack on DEP science is completely false and totally unacceptable testimony. Worse, Martin then falsely claimed that there was no data documenting a public health risk from perchlorate. Martin said: “No one was able to document public health risks to me. No one came up with a scientific study that tells us what the health effects are – there were no numbers to back it up”. Senator Buono then asked if there was no science supporting the proposals, then how did former DEP Commissioner Mauriello justify the proposal? 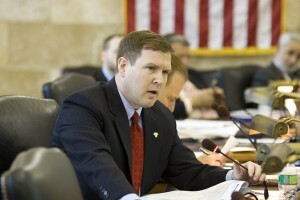 Martin then claimed that Mauriello must have based the proposal on politics or policy. Bob Martin’s arrogance and his ignorance are truly dangerous. Senator Buono, as co-prime sponsor of the Global Warming Response Act, then moved on to strongly opposed the Christie Administration’s diversions of over $300 million in Clean Energy Funds earmarked for energy efficiency, renewable energy, and global warming mitigation funds. Buono began by asking Martin whether he thought global warming was a myth. Martin said no, he thinks global warming is real. Buono then said that it is hard to believe that the Christie Administration takes global warming seriously after diverting $300 million in RGGI and Clean Energy Funds. Martin responded by offering some lame excuses about Christie’sÂ support off shore wind and that he was forced to make tough budget choices. Chairman Sarlo raised concerns that local officials had not been notified about Christie $7 million diversion of Recycling Fund monies. Sarlo said this cut would have local budget impacts and force reductions in municipal recycling programs. 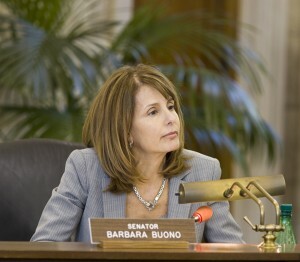 Doherty objected to Senator Buono’s questions and Commissioner Martin’s testimony, and claimed that “man’s activities are not the cause of global warming“. Doherty then proceeded on a rant: He attacked the NJ Global Warming Response Act as a “job killer”. Said wind and solar were 4 times more expensive than coal and would take coal power plants “cash cows” off line. Bragged that the US is “the Saudi Arabia of coal”. Doherty even praised Nazi coal gasification technologies developed during WW II to convert coal to jet fuel. Claimed Goldman Sachs was conspiring to bring us cap & trade legislation so that the US would “go billions of dollars in debts for wind to pay Goldman for it”. DEP Commissioner Martin did not take exception to or challenge any ofÂ Doherty’s global warming denial claims and defend global warming science. Martin merely presented the Chritie pro-wind policies and defended them on economic grounds. Martin claimed that wind manufacturing jobs were key to economic development; that over time wind costs would come down as the technology developed; and energy independence was an important national security concern. “From an economic point of view, we have our eye on the ball” Martin concluded. After Doherty finished his global warming denying, coal supporting, Nazi technology praising, Goldman Sachs cap and trade conspiracy attack rant, he went on toÂ praise the Christie Red Tape Report and expand his rant to include attacks on DEP as an impediment to economic development; the Highlands Act as an unconstitutional taking of private property without just compensation; and call for local home rule at the Highlands Council. Again, Commissioner Marin did not defend the Highlands Act, but merely said he had established a “stakeholder process” to inventory all the complaints about the Highlands Act and develop a legislative and regulatory agenda to respond toÂ them.Â But Martin failed to note several attacks he has engaged on the Highlands. Legislators and the public need to start asking questions about these so called “stakeholder processes” to assure that they are transparent and open to the public. However, EPA documents we have received via a Freedom of Information Act (FOIA) request show that Martin’s claim is false. EPA specifically advised Martin that any EPA national drinking water standards would not be in effect for 6 1/2 years. 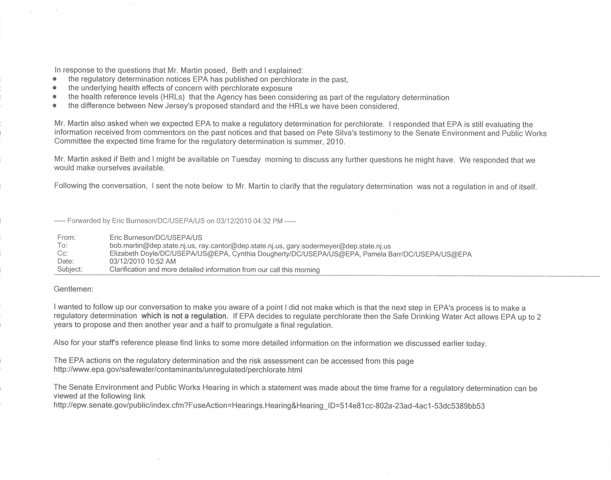 Martin knew that his claim that EPA would “issue standards this summer” to be false at the time he made it. In other words – he lied. They [Martin] also asked whether the final EPA regulatory determination expected this summer would include a specific MCL or single health based value for perchlorate. I explained that it might give an indication as to what life stage we are focusing on, but it would not include a proposed MCL or MCLG, those values would be part of a proposed rulemaking. …. 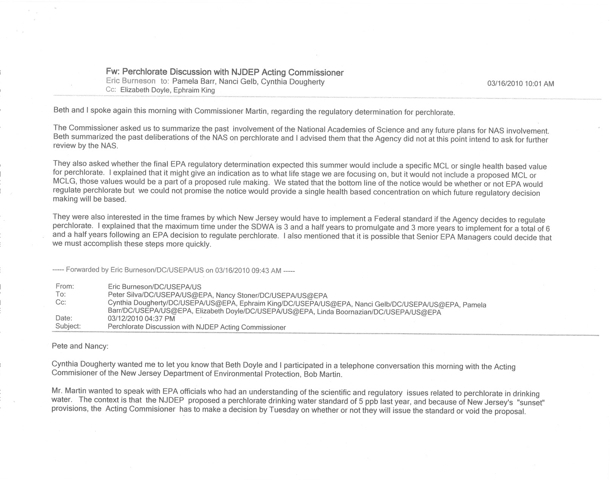 They were also interested in the time frames by which NJ would have to implement a federal standard if the agency decides to regulate perchlorate. I explained that the maximum timeframe under the SDWA [Safe Drinking Water Act] is three and a half years to promulgate and 3 more years to implement for a total of six and a half years following a EPA decision to regulate perchlorate. I hope he is called out on this tomorrow in Senate Budge Committee oversight. Trenton – A decision last month to abandon a multi-year effort to stem the spread of perchlorate, a chemical found in rocket fuel, by New Jersey’s Department of Environmental Protection Commissioner on the grounds that federal regulation would be forthcoming “this summer” is contradicted by e-mails from the federal experts who briefed state officials, according to documents released today by Public Employees for Environmental Responsibility (PEER). As a result, New Jerseyans will be exposed to growing levels of this dangerous chemical for several years to come without any governmental protection. The earliest that any federal standard could be implemented in New Jersey would be 6½ years at the earliest from when EPA decided to act, if it decided to act. Even though Mr. Martin had months to work on the perchlorate issue, he waited until March 12th, just four days before a final deadline to either adopt or reject a proposed state water maximum contaminant level (MCL) of 5 micrograms per liter (ug/L) for perchlorate in drinking water. Martin received his most detailed briefings from EPA on March 16th, the actual day of the deadline. Later that afternoon DEP issued a press release announcing the decision to jettison perchlorate standards, citing impending EPA action. As yet, there is no federal standard (although there is a guideline of 15 ug/L) while California and Massachusetts have 5 ug/L standards in place. Perchlorate has been found in approximately one-sixth of New Jersey public water systems and 1/3 of residential wells sampled. The chemical affects thyroid function, especially in infants, pregnant women and their fetuses. New Jersey’s proposed perchlorate standard could have been finalized when EPA Administrator Lisa Jackson served as DEP Commissioner, but she unaccountably delayed her decision. Now New Jersey’s fate on this issue is again in Ms. Jackson’s hands under a time-line that is no less elusive than before. Will Senate Draw a Line on Christie rollbacks? DEP Budget Up Tomorrow. Tomorrow, the DEP budget is up before the Senate Budget Committee. Senators Bob Smith and Barbara Buono, both strong pro-environment Dems, sit on that Committee. There has been plenty of public opposition and media coverage of Christie’s environmental cuts and policy rollbacks – so surely there is no lack of information for the Committee to work with. Bob Smith, chairman of the Legislature’s environment and energy committee, and a member of the appropriations committee, has vowed to fight the governor over the RGGI funds and the Clean Energy Fund, which the governor appropriated last month. “The question that will come back to me and the other policymakers will be how can we justify raiding this fund when there are much better alternatives. We should continue for at least another year with higher income taxes on our wealthier residents,” said Smith, who is a vocal advocate for economic stimulus through green jobs. The report, released shortly before 11 a.m., says the group had “arrived at a series of unanimous recommendations” — but omits Buono’s name from the cover sheet. Asked about the omission, Buono said she raised concerns after receiving the language of proposed legislation last week but was told the group wanted to present a united report. “The state must achieve a better balance between protecting the public and nurturing free enterprise,” the Red Tape Review authors write. That may well be. But that does not mean the state can abdicate its responsibility to public health. Safe drinking water is a right and necessity. Protecting an area that provides potable water to more than 4 million people is paramount. The DEP’s job is to protect and preserve the environment, not to insert itself into questions of the economic issues involved. That’s for other state policymakers to address. It is much too early to form any judgments on how Martin will do on the job. But some of his statements thus far should give those who care about New Jersey’s environment real pause. Will there be a showdown on environmental policy tomorrow? Let’s hope the Senate Dems rise to the challenge. Trenton, NJ, May 16, 1996. Among all the responsibilities of government, there are few of greater importance, or of more concern to the public than the protection of New Jerseyâ€™s environment and the quality of public health. We know that protectingÂ these important concerns, and carrying out these responsibilities through appropriate State actions and support is a priority you share with the Legislature and the general public. It is in recognition of that shared commitment to protecting New Jerseyâ€™s environment and public health that we write to you today. We are greatly concerned that your proposed budget for fiscal year 1997 does not adequately provide the necessary resources to State government to meet the environmental challenges facing the State. This is especially true in the proposed funding for the Department of Environmental Protection. The proposed budget would require dramatic reductions in scientific, technical and human resources critical to the mission of the Department. In a State facing the environmental issues New Jersey does, we need to respond aggressively to the challenges of insuring that our air is safe to breath, the water safe to drink or the empty lot next door safe to play in. It is highly questionable as to whether the Department will maintain the requisite expertise and resources under the fiscal year 1997 budget proposal to answer these questions and respond in a way protective of public health and the environment. We are also concerned that the proposed reduction in resources will not fulfill the new approaches to environmental protection. The successful implementation of the initiatives under discussion will require additional resources above and beyond those currently available to the DEP. Many of the â€˜â€˜reengineeringâ€™â€™ initiatives being undertaken by the Department will be fundamentally handicapped by the proposed reductions in resources contained in the current budget proposal. Due to these concerns we feel that it is important that you be aware we may not be able to support this budget proposal, should it come before the Senate in its current form The historical erosion of staffing at the Department experienced over past budget cycles cannot be continued because the environmental goals we have outlined above will not be attainable. We feel strongly that the proposed layoffs of DEP personnel will negatively impact the Departmentâ€™s ability to effectively safeguard the environment and protect public health. Therefore, we cannot support a final DEP budget which contains employee layoffs. We feel that it is very possible to identity appropriate resources, sources of funding and approaches to achieve this, and we ask for the opportunity to explore these with you and your staff.